We will show you what Madrid´s diverse FIESTA culture has to offer over the next few weeks! 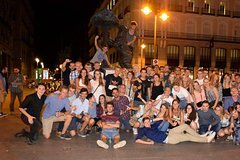 Having the highest bar density in Europe, we will crawl with you from bar to bar always ending up at one of Madrid´s most popular Night clubs . 3 or 4 Bars plus 1 club. each bar shots (tequilla,vodka etc) Discounts drinks at the door, Free Vip Entrance Club. What´s in it for you ? At the 1st bar we will start with drinking games to break the ice between participants. 2nd bar you will have your chance to show us what fancy dance moves you have got. 3rd bar we will escalate a little higher and you will have experience our first vip club. 4th bar would be the ultimate place for the night and there we will witness to rising sun together by busting a move whole night ! Puerta del Sol infront of Apple Store get wristband "Muratti"
22:00. Our guides usually waits extra 10 mins to make sure everybody is on board. If you can`t find us at the meeting point you might as well join us at the first bar.